Google recently named Defenders of Wildlife one of its “Google Earth heros” for its Conservation Registry, an online tool that tracks and maps conservation projects across the country. When the Gulf oil disaster struck, staffers in Defenders’ Oregon office set up a new web page in the Conservation Registry, using Google maps to highlight the spill’s impacts and response efforts. This allows people to easily see, for example, where sea turtle nesting sites are in the Gulf in relation to oil and gas platforms. Clicking on points in the map provides more information about that specific impact or project. “Putting events and actions on a map really helps relay the message and the impact of the Gulf oil spill and it has a much larger impact than just reading it in a newspaper,” says Gina LaRocco, Defenders conservation program associate. Learn more about our work at Google Earth's website. 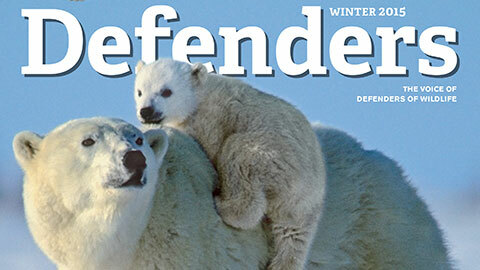 Defenders has long worked to make residents in the West and Alaska more bear aware. Most recently, Defenders partnered with the U.S. Fish and Wildlife Service and World Wildlife Fund to buy polar-bear-resistant metal food lockers for the town of Kaktovik, Alaska. The groups will monitor the bins—meant to discourage bears from wandering into towns looking for a free meal—with the hope of expanding their use to other towns. Generating clean, renewable electricity from sun, wind and geothermal sources is generally a positive step for the environment. But utility-scale renewable-energy projects can harm wildlife and wild lands unless these projects are sited and designed carefully. Defenders recently worked closely with government officials and representatives of Solar Millennium to site the firm’s 7,000-acre solar power plant next to developed lands on the California-Arizona border that environmental groups have already identified as suitable. At peak output, the solar farm could generate enough clean electricity to power more than 300,000 homes, according to project developers. “Early engagement and guidance are critical,” says Jim Lyons, Defenders’ senior director for renewable energy. “When companies have invested time and money in a site, it’s harder for them to make changes that would improve the project.” Learn more about Defenders of Wildlife's commitment to guiding our nation’s transition to clean energy and securing a bright future for wildlife. California taxpayers have coughed up more than $1 million clams for their struggling sea otters over the past four years by donating to the California Sea Otter Fund on their tax forms—and they didn’t let the otters down in 2010. Despite hard economic times, Californians directed almost $250,000 to sea otter conservation again this year. Because they came close to the needed $258,563, a target amount set by the California Franchise Tax Board, the program will continue in 2011. Help get the word out about the CA Sea Otter Fund for 2011.